Our bathroom was doomed. From the minute we bought our home, it was on the chopping block (really though, what WASN’T on the chopping block). However, because bathrooms can be total pork chops on the budget, I had to bide my time until we were ready to do it right. And even then, I was hesitant to get the ball rolling until Moen sent me an email and said ‘Heyyyy girl, you doing any renovating? We’d love to supply you with some products!’ SAY NO MORE! The ball was OFFICIALLY rolling. I would keep the vanity. Because it was built in between 2 walls, I couldn’t just go to a big box store and get a pre-fab unit that I could drop in – it HAD to be a custom size. So, I decided to get it painted and freshened up with new hardware. I would keep the footprint as everything was pretty functional where it was, other than the dead-space behind the door, but I figured out something for that too. I would keep the tub. Our home is only 10 years old and because that shower rarely gets used, the fibreglass tub was in awesome shape. I would use and abuse subway tile. This would keep the majority of my tile sq footage in line with my budget. Let’s start in the hallway…like most hallways, it was visually stimulating and an architectural wonder. Well, it might still be a basic hallway, but NOW it has some personality via a wicked accent wall and is a great lead-up to the main bathroom! NOW on to the good stuff – WINE. Just joking…the loo! Before, the maple vanity and dark surfaces made this bathroom feel heavy and moody (like me once a month) and didn’t make ANY sense with the shockingly white 4×4 tile in the shower. And after…go GREIGE or go home! Maybe I’ll do both seeing as I now LOVE our bathroom. 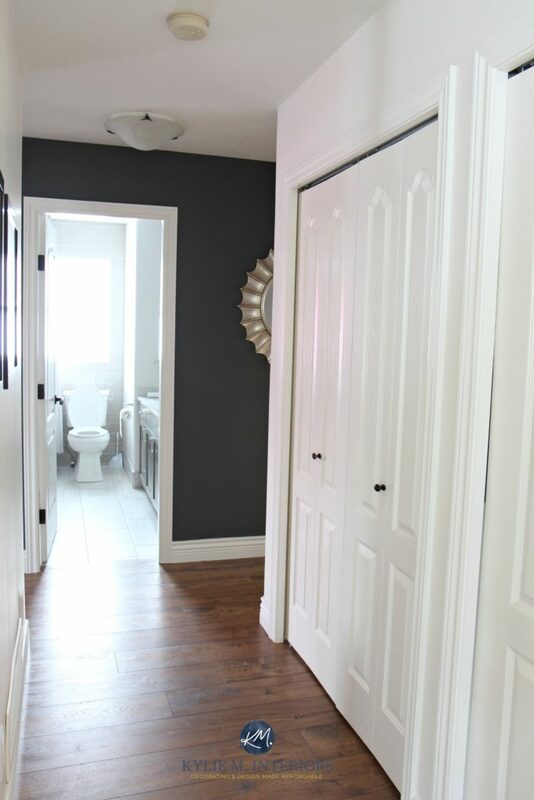 I chose Benjamin Moore Classic Gray for the walls as I wanted a soft, subtle look that didn’t compete with any of the tilework or countertop. And notice it’s the SAME VANITY, just updated with a fresh coat of paint and hardware! I chose Caesarstone Bianco Drift which is a quartz countertop with warm gray, greige, white and brown tones. It was supplied and installed by Super Dave at Colonial Countertops. Seriously, he’s super. And just LOOK at the shower reflected in the mirror! Right from the beginning, I knew I wanted to make the wall behind the vanity into a feature of some sort. I tossed in between subway tile, wallpaper, a wine rack or jazzy accent tile. I went with the subway tile because it was affordable and apparently wine racks in bathrooms are taboo (pshawww). To save some money, I had Delea of Details Painting spray the maple vanity in Benjamin Moore Metropolis. Her work was SEAMless and it saved me a whack load of money! The flooring is a gorgeous 12×24 porcelain tile from City Tile . It has a subtle texture and a mix of white, greige and beige tones. I also chose to use it as my baseboard. I knew that I wanted a 2 handle widespread faucet, rather than a lever-style, so I chose the Glyde Collection from Moen. Because the vanity is 6′ long, I felt like this style better suited the length and I liked the graceful lines of it. From there, I coordinated the light fixture to have the same finish and the same smooth, slightly curved lines. The tub and shower…why would I EVER want to change it? The funny thing is, 4×4 white tile is coming back in style, however I ain’t hoppin’ on THAT bandwagon. I either wanted a large 12×24 tile or some type of subway tile. And the winner is subway tile! After exhausting all of the possibilities (you have NO idea how much I agonize over my own home – there is no wine bottle large enough to settle me) I landed on this awesome 4×10 tile from Lowe’s. MAAAAD love. It’s greige, soft and subtle. I wanted the bathroom to feel fresh and clean, but not ‘stark’ and this did the trick! And instead of stopping the tile at the shower, I took it behind the toilet as well, making the window look a lot more natural to the space. And seriously, the hexagon accent tile just about did me in, I started drooling on site and almost biffed it. I had looked HIGH and low for just the right accent tile and THIS was it! I found it at Cornerstone Tile in Nanaimo. I got Super Dave (yes, there are 2 Super Dave’s in my world) to order it for me and 5 days later it was in. The warm greige tones were a nice break from the traditional white/gray/black marble that I usually work with in my consulting. I decided to make a 10″ high wall-to-wall niche for a simple look with some function. I didn’t want it to POP, but I did want it to be a classy statement. Notice how the subway tile continues right to the end where it meets the alcove seamlessly. I also chose the Glyde Collection for the tub/shower, for a coordinated look. I’m not really into the huge rainheads and like the simple, low-key look of the Glyde unit. Now for the awkward area behind the door/shower area. I got this linen tower on clearance at Lowes and it filled up the space perfectly. Along with my Glyde robe/towel hooks, this area is now functional and pretty darned purdy! And look at how soft and subtle Classic Gray looks. I darkened it by 25%, just to give it a weeee willy wink more depth and it still offers just the right gentle touch for this space. And who gets MAD props on this project? Brett Edwards, that’s who! Brett of BE Tile did an awesome job from start to finish. He humoured me (as most people do) when I couldn’t make up my mind and went above and beyond to make sure that everything turned out JUST how I was hoping. The only negative was that he didn’t bring his baby Maxwell over enough so I could get my baby fix! Want to know if painted maple cabinets will last? And just WAIT until you see our Entryway remodel – it’s a GAME CHANGER for our home!!! Want some personalized ideas for your own home? Check out my Online Design Services and Color Consulting! I LOVE IT!! Every darn tootin’ detail lol. I’m a gray greige neutral loving kinda girl. Fantabulous job. I now have tile envy lol. Has to be a total pleasure walking into that door. I have had classic gray on my list for some time now but worried it would be too light. After seeing yours darkened by 25%, and it still looks light and fresh, I’m sold! Thanks so much. Great job. What a transformation Kylie! It is just beautiful! I would love walking into that bathroom every morning. I love Jesus but I’m glad you got rid of the light, lol! You are so talented. OMG, so purdy! And I’m not even a griege fan but love how soft & light it all is & decision to frame mirror w wall vs keeping full wall mirror–I don’t know that that would ever have occurred to me! Ok, big question about cabinet painting, which you’ve posted on before: my niece claims that you can paint cabinets with chalkboard (or maybe just chalk?) paint instead of sanding before painting your chosen color. But I run this by the hardware store guy who says just to wipe it down w deglosser. What’s the best lazy-girl way to prep bathroom cabinets? Where did u purchase light fixture? Love, love, love the light fixture. Can you provide the manufacturer and model information. Thank you! Hi Tami! It was a few years ago now, but we actually got it from Lowes! BEAUTIFUL! You mentioned the tile was from Lowes, but I am unable to find it. Will you please share the brand and color? Just the inspiration I needed! Beautiful job Kylie! What is the color of your floor tile? It is stunning and just what I’m looking for. Your bathroom is gorgeous and an inspiration for our upcoming remodel. By chance were you able to verify the name and brand of your tile floor? Thanks so much for sharing. Hi Kathy! I believe it was called Bellagio (Beige or white) from City Tile here in Nanaimo – I’m not quite sure who their main supplier is though…I hope that helps a bit! I was curious if the tile went all the way to the ceiling prior to the remodel or is that something you added. I was just going through a contractor not a designer but he thought the tile going all the way up would make my small bathroom look even smaller. Hi Kim! The tile didn’t go all the way up, and it can actually make the bathroom look larger as there will be less breaks in horizontal surfaces – consistency is much better, I’d go all the way up every time! Hi Kylie, nice project. I love white kitchens, My counter top is in granite with dark and light brown spots. Will it a good choice to paint the cabinets in white? What is the inside (top and bottom) of your awesome tub niche tiled with? It looks like you used a schluter edge and a shiny tile in there? It looks great! Hi Susie – it’s the actually the same subway tie that is on the walls! Love your bathroom! Do you remember the make, material and name of the hexagon in the bathtub inset? Exactly what we are looking for! Thanks!! Hi Christina, thank you! I don’t, it’s from a local store called Cornerstone Tile. Next time I’m in there I can ask them! Hi Scotti! It was actually a sink provided by the countertop company. I’m not sure of the brand, but it’s a series that they offer when you purchase the countertops – worked for me! Can yoou provide the information about the sink? Hi Shar, it’s the Pearl brand and was supplied by the countertop company – Colonial Countertops, so it’s not a Home Depot/Lowe’s type of thing, more of a speciality thing (but not priced that way, just special in that they carry that specific brand). Hi Patti! I’m pretty sure the floor tile was the Bellagio line – there’s a few of them, and it was the lightest one of the 3. I hope that helps! Kylie, I love your remodel and would really like to know the brand of the light fixture. I’ve looked extensively at Lowe’s online and can’t seem to find it. Nice job. What’s the color of cabinet? Hi Kylie, your bathroom looks amazing! and the full width recess niche is a really nice touch – was it a lot of work in terms of framing? I assume parts of the studs behind the wall had to be removed and a header needs to be added? Hi Tian, thank you! Yes, they had to cut into the studs and reframe a bit with a header, but it was WELLLL worth it – it turned out pretty darned cool and in the ‘carpentry’ world it was pretty straightforward stuff! I am new to this remodel thing. I get anxiety picking a color! Your videos really helped me with understanding undertones. In your hallway is the baseboard painted the same color (creamy) as the walls? I was trying to go with a gray/griege color in my hallway but I have three storybook windows down a very long hallway that are north facing and it is pretty dark. 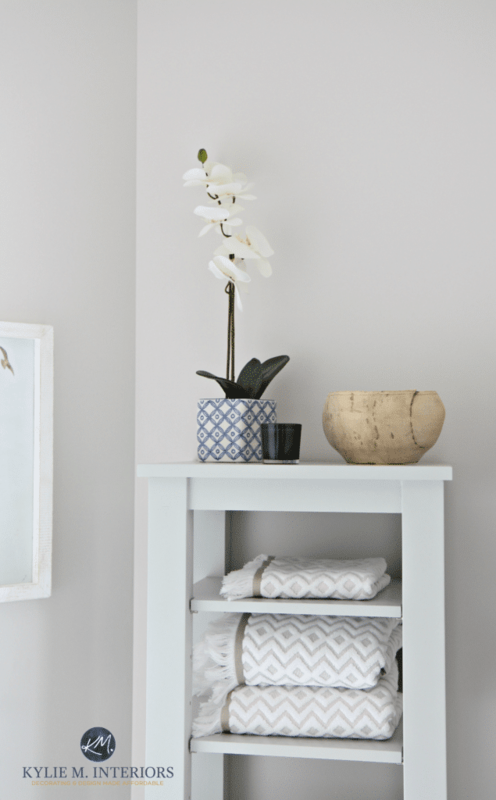 Any of the cooler grays I pick (Big chill, crushed ice) when painted on the wall look Blue! I tried repose gray and it looks green! I’m stuck! I want it light and bright. Any other colors you could suggest? Wow!! Amazing transformation. I love the colours you’ve chosen. It’s so bright and fresh and clean looking! Very up to date too! Hard to believe the vanity is just painted with new hardware! Oh my goodness! I just love love love the final outcome! Awesome! Thank you Judi! 6 months later I STILL love it, which is rare for me as I get tired of things really fast (it’s an expensive hobby….). And it IS amazing what a lick of paint can do! I’ll be doing a blog post on our Office Bathroom shortly, it’s pretty awesome, I can’t wait to show you! I LOVE they grey subway! We are using the same line for our remodel. Did you use a white grout? It looks like it might be a smidge darker than white but I can’t be sure. Trying to use a grout that won’t be as high maintenance as white. 🙂 thank you! Hi Sarah, it was definitely a lighter gray colour – Silver I think???? I’m REALLY glad I didn’t do white grout! Have you mentioned where you purchased your pulls for the cabinets? thanks so much for your post- beautiful post and I am very much inspired! Hi Nicole, those were actually good old Home Depot! What’s your countertop made of? Color? Thanks! Did you use tile on the top and bottom parts of the shelf in the shower? Your tile and cabinet look great. Why the boring mirror? Haha! Yes, it is a boring mirror and that’s for a few reasons! #2 – with a feature tile back wall and more detailed light, a decorative mirror would have been TOO much competition – over the top! Trust me, thought goes into every choice I make! Have you ever used BM Classic Gray darkened by 50%? I used it in a bedroom darkened by 25%. It looks great on 3 of the walls but one wall looks washed out by the natural light in the room. Hi Debby, good question! I get a bit nervous at 50% because I’ve found that 25% tweaks a colour, but doesn’t really alter its undertones. Whereas 50% can sometimes be a bit more unpredictable. The only other thing is that in the evening when the sun is down and ‘all is equal’ there will be a more noticeable shift, that being said, there is a shift on every wall due to shadows anyway! 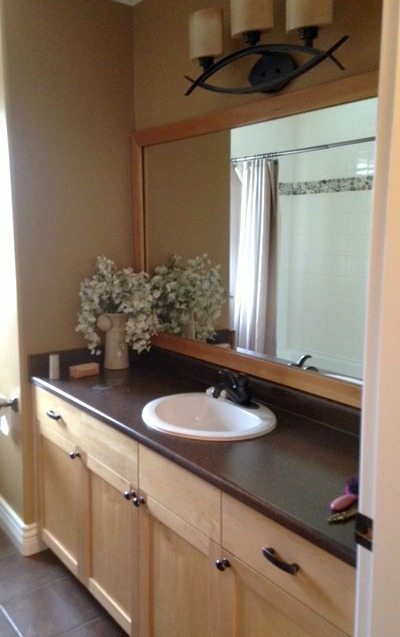 I love the colour of your bathroom cabinetry. Is it the same colour that you used for the cabinetry in your bar area? So beautiful! Well done. 😊 I had a bathroom where you could see the toilet too and so I installed a spring hinge on the middle hinge and the door swings slowly shut to spare the view! I also put a “WC” on the door so guest no where to find it! I really like your choice of subway tile in the washroom. I have read the article several times and I know that the tiles were purchased at Lowe’s but I didn’t find the colour of the tile. Do you remember the name? Hi Richard, I think it was something like ‘Pearl Gray’ perhaps, from the Allen and Roth line – unfortunately we’ve since moved so I can’t look at the spare box! Hello Kylie, your remodel is beautiful!! If you don’t mind my asking, how much did this all cost? I am wanting to make over my bathroom and just want to be realistic with a budget. Plumbing: I was given the plumbing fixtures by Moen and just bought a $350 toilet. So I would say in the end, hardware, paint, all that jazz, between $5-$6000. We’re redoing our shower and I was hoping to make a niche just like this! Wondering how you made it go end to end with the studs being there? Hi Tam, it was a non-load bearing wall, backing onto a closet, so we cut into the studs and had the fellow rebuild around them a frame of sorts for the niche to sit in! Did you use same grout color for floor and wall tile? Your bathroom turned out great! What is the length of the vanity? I ask because I want to get a 60″ with one sink but the opinions from my daughter and the plumber is that 1 sink will look weird on a cabinet that long. Forgive me if this has already been asked. How much did you budget for this remodel? Love love your remodel!!!! What type of tub did you go with and color? I may have missed it but what is your trim paint in bathroom?